Pocket Springs are individually wrapped coils which move independently. This free movement allows for the spring to completely contour your body offering total comfort and support. "No partner disturbance" is a fantastic feature which allows for a peaceful, uninterrupted nights sleep. Zoned Pockets Spring Unit features a centre zone system. With a heavier gauge spring through the centre third of the unit, zoning offers extra support through your core section keeping your body in natural alignment. If you are fed up with feeling aches and pains on a morning due to sore pressure points, a Pocket Spring mattress could be for you. Pocket springs are individually created and then placed in their own fabric pockets, which allows the springs to move independently of each other The result? Support for you and your partner where it's most needed, regardless of differences in weight. 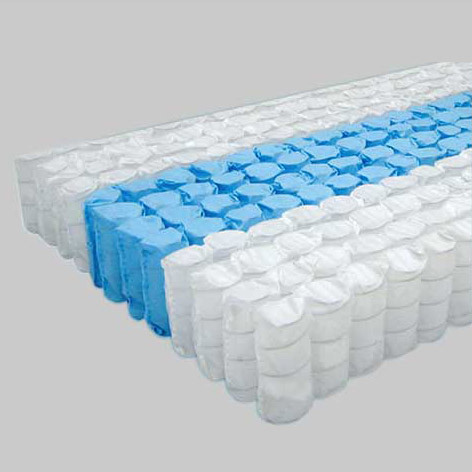 Pocket springs can also be combined with other mattress fillings for a better effect. Pocket Spring and Memory Foam mattresses are becoming increasingly common now, as both pocket springs and memory foam have their own unique qualities for supporting your body. Pocket Springs can also be combined with other mattress systems such as Foam, Latex and Open Coil spring systems. Pocket Spring beds also come in a range of tensions which cater to different requirements. Firmness on a pocket spring system is usually dependent upon the how many springs are in the mattress itself. Generally, a spring count of anywhere in between 800 and 1475 is classed to be medium tension, where as 2000 up to 3500 is generally classed as firm or orthopedic.